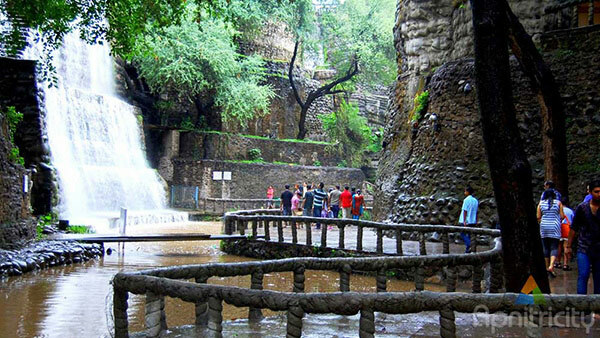 After the British left India in 1947, Indian architecture dropped into an abyss. 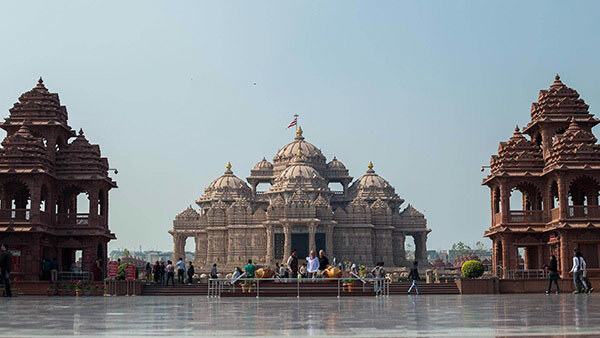 Indian architects during the British period had been relegated to being assistants, and they were not involved in the actual design of monuments. In his initial survey of New Delhi, Corbusier saw for the first time the dismal state of Indian modern architecture. Consisting of pale and bare facades, these buildings had been built by the Public Works Department, whose architects were probably more concerned with hanging on to their jobs than creating. The Supreme Court in New Delhi was itself a desolate interpretation of the buildings of the Raj. Jawaharlal Nehru, the Prime Minister, had called for an open architectural competition for the design of the Ashoka Hotel in 1956, which was won by B E Doctor, an architect from Bombay. Using technology to create large pillar less spaces, Doctor created a facade which borrowed from Islamic, Hindu, British and modern architecture. But the criterion was not to repeat nor to borrow, but to create a definitive new style altogether. Three years after independence, Charles Edourad Jeanneret aka Le Corbusier, was hired by the Punjab government to design the new city of Chandigarh. The initial plans for the proposed city had been made by Mathew Nowicki who had died in an air crash. Given the role of a master architect, Corbusier took on his responsibilities with a spirit that encouraged Indian architects to work under him. The city of Chandigarh, designed completely by him, was the epitome of where modern architecture could go. Built in three stages, Corbusier divided the city into three sections. The `head’ consisted of political, bureaucratic and judicial buildings, the administrative parts of the city. The `body’ housed the university and residential complexes in the heart of the city. The `feet’ consisted of industrial sectors and the railway station. Apart from the initial layout of the city, Corbusier also designed buildings in Chandigarh. The High Court building has a sloping roof, supported by concrete walls which allow air to pass through them. The Assembly is a squarish structure topped with a huge industrial chimney, not unlike a Buddhist stupa. The Secretariat is made up of hundreds of rooms with an airy exterior. In making the Secretariat, Corbusier borrowed heavily from his earlier buildings in Marseilles. The Open Hand Monument, a huge open palm pointing to the sky, in Chandigarh is Corbusier’s tribute to creativity. Elsewhere in Ahmedabad, a young architect was designing the Institute of Indology. D V Joshi, Corbusier’s protégé, was exploring possibilities with concrete. He had begun work on Premabhai Hall, another extravagant structure like the Institute of Indology although falling way short of Corbusier’s elasticity with space. Charles Mark Correa, Doshi’s contemporary, designed the Hindustan Lever pavilion for the India International Trade Fair in 1961. The pavilion was an exposed concrete structure resembling a crumpled packing case made of concrete with a zig-zag ramp to walk along. Correa designed the Gandhi Sanghralaya in Ahmedabad as a tribute to Mahatma Gandhi. The structure is in the traditional ashram design with a pool in the centre and airy roofed halls within the building itself. Delhi Flourished as Prime Architectural Site of Modern India. Unlike Chandigarh, which was started on a clean sheet of paper, building Delhi posed a problem. There were already thousands of monuments, and the city was burdened under layers of constructions built over centuries. The first plan was to build affordable houses by the thousands, and the ultimate to make it into an urban Americanized city. Nagars, Vihars, Purams and Niketans blossomed up, and with them jhuggis (slums). Delhi boasts of the largest housing project in India, but there are still thousands of people living on the fringe of economy who cannot afford a house. With the Trade Fairs came a new concept in design. Building halls and their subsidiaries without help from the Public Works Department became a task in itself. In fact, this was the turning point in Indian modern architecture. Raw concrete, which could be cast at the site itself, proved to be the most suitable material for building, along with iron and steel. This had been seen earlier during building Chandigarh and Ahmedabad, and massive new buildings in stark concrete seemed to herald a brave new world. In Delhi, brand new high rises sprang up where once the 70 meter Qutub Minar had been the tallest construction, surveying all and sundry from the 12th century. The area around Connaught Place, originally in Lutyen’s plan, underwent a sea change. Large bungalows gave way to tall multi storeyed buildings, a feature now becoming common to almost all major cities in India. The Asiad Village was built as a colossal complex with more than 800 residential units, landscaped courts, streets, restaurants and shops, all catering to sportspersons who assembled here for the Asian Games. 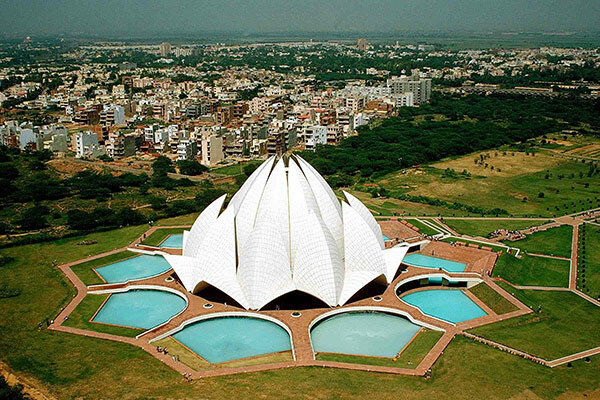 The design of the Bahai temple in New Delhi is inspired by the lotus, the symbol of purity. Surrounded by nine large pools of water, the nine sided temple is made of petals of white concrete which are covered with white marble panels. 70 meters in diameter and over 34 meters high, the temple was designed by Fariburz Sabha in 1980 and completed in December 1986. Indian architects had come to terms with the rapidly expanding need for consolidation of space, and width was compromised for height. High rise constructions in the West formed the basic model, but Indian buildings still lacked the slickness of a modern Western edifice. Big cities like Bombay, Calcutta, Madras and Bombay bore the brunt quick construction in little time and space, overshadowing construction legacies laid down by rulers of yore. However, more than a thousand kilometers away in the south, a different kind of architecture was unfolding. Modestly constructed and priced houses were flourishing in suburbs, and even mud constructions were coming up. Architects working with this medium followed the Egyptian architect Hassan Fathy’s conventional norms, building temporary houses as well as permanent buildings. Simultaneously space and volume was being experimented with in concrete. The Oberoi hotel in Bhubaneswar is a classic example of the intermingling of the concept of a Hindu temple and a Buddhist monastery. Modern Indian architecture borders on the absurd, eliminating previous designs and experimenting with new ideas. Harsh lines instead of soft curves dominate, and the basic design is flat and square instead of round. Going by tradition and after tracing Indian architecture through 2000 years, modern Indian edifices seem a little jaded, if not forced. Gone are the subtle details of Muslim, Hindu and Jain architecture which leap forth on second glance. Gone are those little carvings which create awe. Gone are those colossal domes and the intricate patterns on walls and pillars. Straight lines or stark concrete, high rises or sprawling hotels, Indian architecture has come a long, long way from Mohenjodaro and Harappan era.